Add a product to your basket, identification, confirm your order... It's at this stage that you will be able to select the payment method of your choice. Credit card payments are totally secure (https & SLL) and are made via our bank partner's website. We accept most types of bank card (except AMEX) including Eurocard/Mastercard and Visa. Once you have chosen to pay by bank card and have clicked on the option "confirm my order and proceed to payment," a secure window from our bank will open. You will enter the details of your bank card directly onto our bank's secure server. At no time are your bank card details visible to us neither are they stored (even temporarily) on our servers. You can choose to pay your order with Paypal, even if you don't have a Paypal account. If you have a Paypal account, you can use it for your purchase. Otherwise, you can use your credit card to pay with Paypal. We only accept payments by cheque in Euros from banks with representation in the Euro Zone. To pay by cheque please select this option from the list of payments available when placing your order. 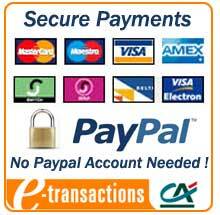 We accept bank transfers from French, European and international banks. Information required to pay by bank transfer can be found on your order. We are willing to share bank costs for international transfers.